The Arkansas State Archives will hold the second lecture in its series, Pen to Podium: Arkansas Historical Writers’ Lecture Series, on Tues., Mar. 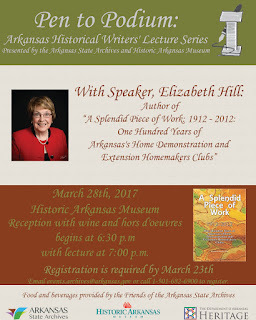 28 from 7 - 8 p.m. at Historic Arkansas Museum in Little Rock, Department of Arkansas Director Stacy Hurst announced today. 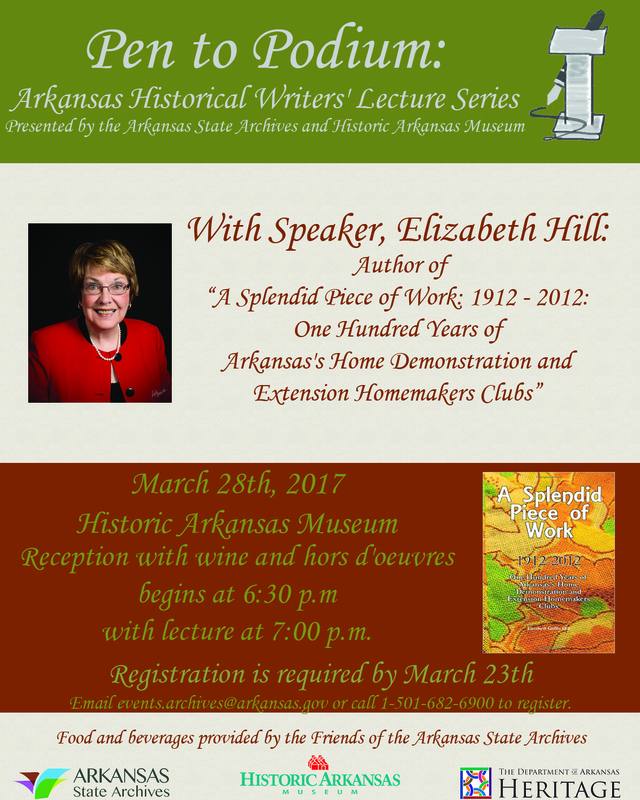 Elizabeth Hill will present, A Splendid Piece of Work: Arkansas’s Early Home Demonstration Clubs in recognition of Women’s History Month. Before the lecture, a reception sponsored by the Friends of the Arkansas State Archives will begin at 6:30 p.m. in the atrium of the museum. James R. Turner was born on August 7, 1848, to William R. and Elizabeth F. Ewett Turner of Phillips County, Arkansas. He was a livery merchant for twenty-five years in Poplar Grove (Phillips County) and also served as postmaster for twenty years. He married Retta N. McCoy on February 2, 1868. They had several children including Robert N., Daisy, Eva, Templin, and Cavett. He served as Justice of the Peace for eight years, following in his father's footsteps. In 1869, he became a correspondent for the "Southern Shield" newspaper. After he lost everything in a fire, in 1895 he established "The Shield," a Helena newspaper. He was a member of the Knights of Honor, and he and Mrs. Turner were members of Knights and Ladies of Honor. He died June 9, 1936. This collection contains invitations and programs of various social activities in and around Poplar Grove, Helena, and Marvell, Phillips County, Arkansas, including Knights of Honor and Knights and Ladies of Honor events that were attended by James R. Turner. There are also items related to President Theodore Roosevelt's visit to Little Rock in 1905. Other items in the collection include a Justice of the Peace commission for William Turner (James R. Turner's father) and a land grant issued to Walter and Sarah Burress. 1892 April 23: Letter: R.W. Nicholls, President, Sons of Veterans, Helena, Arkansas, to "Sir"
Undated: Postcard, "A New American Novelist"
The workshops will cover the current Arkansas general records retention schedule, how to maintain and preserve records, donation of records to the State Archives, and electronic records. All meeting will be held in the Arkansas State Archives conference room, located on the 2nd floor of the Multi-Agency Complex at One Capitol Mall, Little Rock, Arkansas. Meetings are open to the public. The Black History Commission of Arkansas will hold a regular, quarterly meeting on Thurs., Feb. 9, 2017, at noon in the Arkansas State Archives conference room, located on the 2nd floor of the Multi-agency Complex at One Capitol Mall, Little Rock, Arkansas. This meeting is open to the public. The Arkansas State Archives is opening a new exhibit, "On the Fields and in the Trenches: Relics of the First World War," which features World War I artifacts held in the State Archives museum collection, Department of Arkansas Heritage Director Stacy Hurst announced. The collection includes weaponry, medical equipment, medals, photographs, a uniform and a variety of military helmets from several countries.